Going back to the TXA debate and comment that “trauma patients are usually either hypercoaguable, or have normal coagulation” is there any increased risk of thrombotic events associated with administration of an antifibribolytic like TXA given a LY30 value that indicates the patient is already hypercoaguable? Great question. Check out the Hunter Moore article on TXA that I listed in the references. 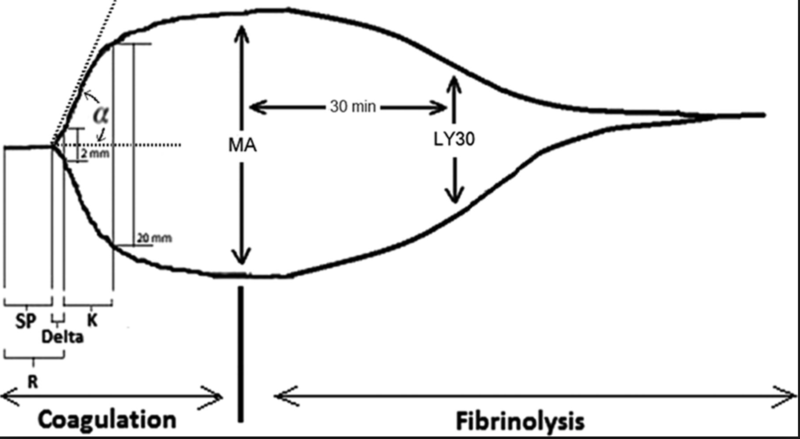 It found increased mortality in patients with normal levels of fibrinolysis that got TXA. Not a randomized trial though. Here’s what Dr. Sikorski had to say: We really don’t know if there is an increase of VTE if the patient is hypercoagulable on TEG. There is some data that suggests an increase in incidence but none that I am aware in a large randomized trial. I am sure we have given TXA to many hypercoagulable patients before getting a TEG especially prehospital. Trauma patients have a high incidence of VTE in the ICU post Trauma, as you know. What percentage of them have had VTE due to TXA is NOT known. Thanks guys – great podcast! For those listeners who use ROTEM as opposed to TEG we have put together an interactive ROTEM learning package which is by far and away the most commonly used viscoelastic device here in Western Australia. RiaSTAP (Lyophilized Fibrinogen Concentrate)also known as Haemocomplettan​ (outside of the US) is FDA approved in the US for treatment of acute bleeding episodes in patients with congenital fibrinogen deficiency (CFD), including afibrinogenemia and hypofibrinogenemia. It is not approved for use in Trauma resuscitation or dysfibrinogenemia.